Since the death of my father three months ago, I have re-read parts of A Grief Observed by C.S. Lewis, the blunt opening line of which tells the truth: “no one told me grief feels so like fear.” That’s about right. I have watched two people die: my daughter and my father. Both occurred in controlled hospital settings, both were expected events, and both (God’s sustaining grace notwithstanding) hurt like hell. Otherwise, I have been entire shielded from direct experience with death for most of my life. All my grandparents were gone by the time I was 13. I barely remember their funerals. While there no algorithm exists to calculate which loss felt worse (daughter Naomi, or father Jack), the fact that my daughter was 15 days old and my father was 82 certainly made the former unutterably more jarring than the latter. Really, the two experiences are incommensurable. One of my father’s maxims was, “Most people worry about things that never happen,” the same basic idea behind Mark Twain’s, “I’m an old man now and I’ve seen a great many problems I my life, except that most of them never happened.” Sadly (in a way), he never took his own advice when it came to the path he would walk with the IBM condition. He never wanted to join any online forums for fellow sufferers, was never interested in participating in clinical trials nor in trying this or that alternative treatment. He wanted a magic bullet, and he anxiously fretted about what the next decline would look like. I can’t count how many times I prayed that prayer, daily, afterward. And while it will never be known if he experienced a bona fide physical healing from his multiple medical problems, that two-fold prayer was answered. First, his vascular dementia virtually vanished in his closing week on earth. He was lucid, clear-thinking, no slurred speech. He was sharp as a tack and wanted to talk about issues that arose in my recent interview on fatherhood and manhood with Dr. Gordon Dalbey. My mother, Marian, told me that he didn’t seem all that interested in the Dalbey interview when she shared it with him on the home computer two weeks earlier. Appearances can be deceiving. For in the ICU, my father wanted to talk about the issues that arose in that Rev. Dalbey interview: about his own father, about God as Father, and about the insights connecting all the above. I ended up reading to him parts of Dalbey’s fine book Fight Like a Man: A New Manhood for a New Warfare. So the extraordinary lifting of his dementia was the first answered prayer. It spared me the hatred of it that would arise in my heart when talking to him. Second, my father managed inexplicably to dodge a sizable list of disastrous medical outcomes that could easily, as his doctors warned us, have befallen him: there was no eleventh-hour heart attack; his severe pneumonia cleared up for the most part; we were spared any debates over feeding tube protocols; and there were no nursing home scenarios, which would have been excruciating, owing to a bed shortage in Nova Scotia that would likely have meant him being sent a hundred miles away. I even prevented a nurse from accidentally drawing blood, which, for reasons too complex to describe to her, would have plunged him into an ocean of pain. All of these scary options were taken off the table by the gentle Father of Providence. “Because I wish I could trade places with you,” she replied. He looked at her intently, and said, “I’m okay, Cindy; I don’t mind.” And drifted back to sleep. 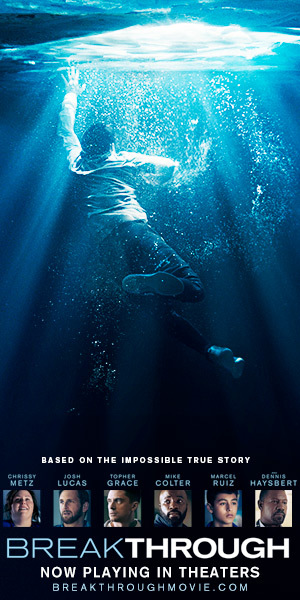 Not too long after, his eyes opened, and he blurted, “Come on God, let me go, please…come on.” Then a very long pause. And then he perked up: “Oh—okay,” as though some inner point of disagreement had been amicably settled. Back he went into that peaceful slumber. Later in the morning, a kindly looking man turned the corner into the unit to visit my father. Then I recognized him—a team leader on my first Challenge weekend, the youth wing of the Cursillo Movement, on November 4-5, 1979. That weekend was the occasion of strong graces for me and my family. I remembered Deacon Wilf Boudreau from my framed picture of the weekend, and I had not seen him since. Yet here he was, almost 40 years later, his face shining with happy confidence. We reminisced about what the Lord has done in our family, beginning, in important ways, with that retreat weekend. Deacon Wilf said a prayer with me, and for Jack. Three hours later, in the bosom of the Easter Season, my dad quietly slipped into his own Holy Saturday experience. I’ll mention one more grace. A few days before he went to meet his Lord, my dad—who was, shall we say, not prone to overt public compliments to my mother—blurted out to her at the foot of the bed, “I just want to tell you that you look beautiful today.” My flummoxed mom caught her breath and smiled, and my sister and I wondered how long it would take her to retrieve her jaw off the floor. It was lovely. Our task going forward is to continue adjusting to the new normal of not being able to call or see him in person again in this life. Jack’s idols included Muhammad Ali, Archie Bunker (he played Archie to my Meathead many times when I was a brain dead liberal), Elvis, Jack Nicklaus, Father Mike Scanlan, TOR, and Bobby Hull. He also despised the Montreal Canadiens, and all their pomps and all their works. I miss him. I have re-read parts of A Grief Observed by C.S. Lewis, the blunt opening line of which tells the truth: “no one told me grief feels so like fear.” That’s about right. These days, I feel fragile, oversensitive to noise, prone to getting teary-eyed over mildly sentimental things. Sarcasm on Twitter and Facebook vexes me, especially my own. I feel the need to be around people but I don’t necessarily want them to talk to me. Requiescat in pace, Dad. Give St. Naomi a squeeze for us. Patrick Coffin is a host, author, and speaker at patrickcoffin.mediaand the creator of www.coffinnation.com. 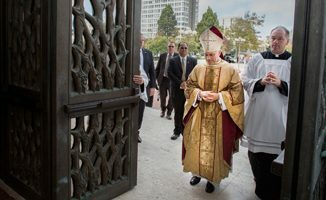 Will the Amazon synod open the door to women deacons? Beautiful Patrick, thanks. I’m going through a similar experience with my 90 year old father who has battled Parkinson’s Disease for 15 years. He is a physical wreck but he loves life and keeps on giving us time to love him. It is incredibly difficult to see him suffer, but you remind me what a blessing this time is. Thanks. Please pray for Dad and me. I took care of and watched both of my parents in their illness and for the last time. I can remember your first time on Catholic Answers. Your first caller was your Dad, which made it so different from all the other calls. As I have tweetered before, I too lost my father seven years ago-Eligio, and my wife and I have lost three children to miscarriage; Michael Matthew, Patrick Peter and Issac Isaiah. I am so very sorry for your loss and offer deep heartfelt condolences, God bless them both. In our grieving we were told to name each one of these little ones and also miss them very much. We have not been able to share the loss of these siblings with the other children, we don’t know how. You, Jack and Naomi as well as your mother and wife will be in my prayers. “Be saint, what else is there?” There really is no rational, reasonable way to say good bye, i still haven’t been able to say “Adios Papa”, as often as i remember I ask him to watch over my boys in heaven and my children with me. I’ll be listening and reading. Oh, Patrick. So much of this resonates, my friend. 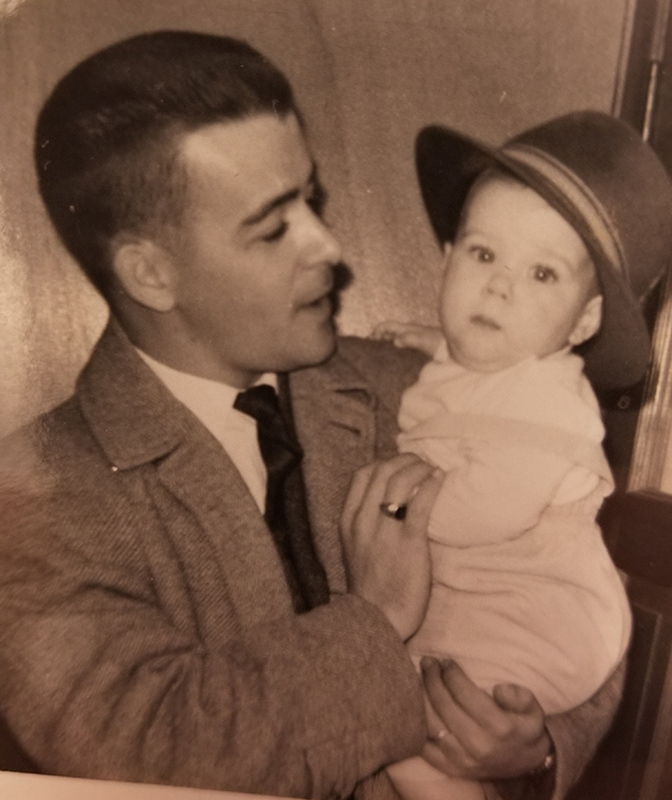 A few years back I lost my dad first, then my brother with dementia got lost for 10 days…then mentally lost & gone within a few years…and in my case being the last one left is tough. I’ll pray for you. And your dad. Your precious daughter was probably on hand to welcome him home. God bless you. Thanks, Elizabeth. We Catholics are also Pentecostal. The Holy Spirit is the soul and life principle of the Church — thank you so much for the kind words! Praise the Lord. It was a great blessing for me to read this. My beloved mother-in-law is 90, and in an advanced stage of dementia. No one who has personally experienced what it is to see a family member or dear friend go through this can imagine what it feels like. Our good God has His own reasons for this, and obviously in your father’s case, it was to see the graces He bestowed on all of you, even when it seemed He was far away. You and your family have my respect and condolences. BTW – I can easily see who you received your good looks from! I feel certain your dear father is rejoicing in the presence of God! Thanks, Erica. Yes, St. Teresa of Avila is right: this life is a long night in a bad inn. But God is good. Sorry to hear about Cash’s father. Thanks for writing this helpful article. There actually is a rather good guidebook to grief. Published last July, it’s called ‘Getting Grief Right’, by Patrick O’Malley. The title is ironic as O’Malley, a therapist who also has suffered loss, finds there is no right way but that everyone’s narrative is their own right way. You would not regret reading it. This was very moving and inspiring, thank-you Mr.Coffin. Very moving. I had tears in my eyes. God bless you and your family. when I seen that picture of the hands clasped I thought I’d seen my Dad again. 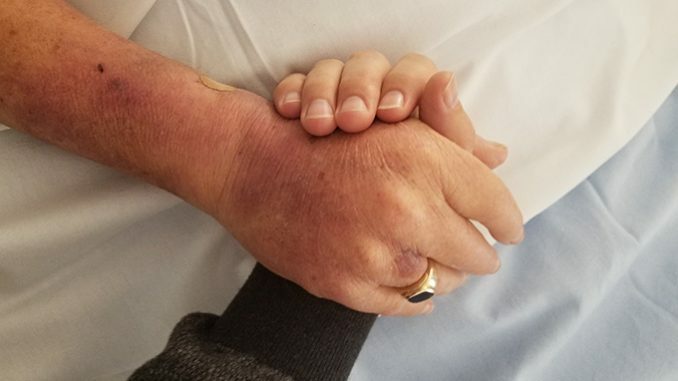 That is the picture I still have of my Dad as the last time I seen him in the hospital where we interacted he squeezed my hand hard just like that for about a minute before he went back into his Deep sleep again. He was 5 months shy of his 82 birthday last November 15th (6weeks after a massive stroke) when he passed at 5:40am. The last couple years early stage dementia had set in, my Mom and siblings would tell me stories of it, but myself living 9 hours away in Ottawa rarely seen any signs, he was still my strong Dad who could do anything in his own humble way never bragging to anyone nor admitting defeat. He wasn’t the church type nor catholic, but always marvelled at my wife Pauline who is a lot like his own Mother who taught Sunday school at the local United church on St Joseph Island. Never one to pray but always the one to ask my wife Pauline to pray for us at family meals. Those lhospital visits after his stroke occurred on Sept 30 were tough, especially for my Mom travelled 45 mins twice each day to stay with him in hospital, only missing one day due to a storm. I will close with this, just before he squeezed my hand he had raised his right arm up (the only body part he could still somewhat function) in the air and pointed directly across the room for about 45 seconds at the blue plastic rosary I had placed on the rooms bulletin board. I’m not even sure he had ever seen a rosary in his life not being catholic but this signal told me I was on the right path and he was simply telling me before he was pass away a few days later. Wow, what a story Tracy. Thank you. I’m speaking in Calgary with Lizzie Reezay in Sept at the Rock 2.2 conference. Your dad sounds a bit like mine, personality-wise. So very beautiful, thank you for sharing. Our broken hearts make us more capable of friendship with the broken hearts of Jesus and Mary and all those we meet on our journey. I lost my father when I was only 5 years old. I have vague memories of him, some of which are questionable as to their authenticity, probably some wishful thinking on my part. But what is vivid in my memory is the day he died, the funeral and the visits to his tomb every Sunday for one whole year. I resented, and I was angry with my siblings, when they told me stories of how wonderful a father he was, prone to waking up his brood no matter how late at night or early in the morning to treat them to ice cream (he worked night shifts as a cashier in a club). During my difficult teen years, I used to visit his tomb by myself and cry my heart out. How I miss him to this day (I am 77 now). Last Father’s Day, I was not sure if my son would visit so I decided to spend the day, not as a father, but as a son, the son of my earthly father and the son of God the Father. 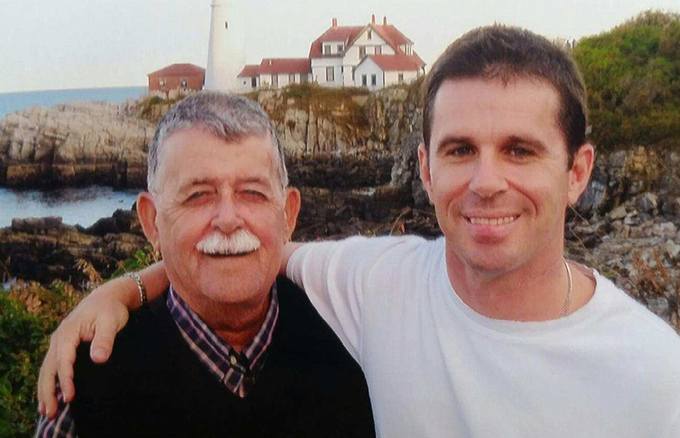 Patrick, how lucky you are to have known and loved your father, enjoyed him when he was strong and healthy, and cared for him when he was sick and feeble. Only God knows why He did not allow me to have such a privilege. I look forward to the day when my father and I will meet again in heaven (I hope!). Thanks for the share Jess. All is a mystery. Thank you for your wonderful true story-dad and son. I wish my own sons to be like you. I have three sons, but, after they finished college I paid off everything, they simply try to stay as far as possible from us. It seems they were overwhelmed by the this world dominated by spiritual secularization which destroys the family and any moral values left untouched. Very painful situation, Alex. Don’t stop praying for them. Thank you, Patrick. That was beautiful: a tribute to your father and glimpse into your soul. May your father rest in peace in the Lord Jesus Christ. I look forward to talking with you tomorrow. Your Excellency, thank you very much. Appreciate it! I am sorry you have joined the “lost a great dad” club. I have been a member ten years. God blessed us with special men and will continue to bless us because of them. They are a heck of a lot to lose but we get through it. Congratulations for being the son of a good man. I so enjoyed your article Patrick. I just came into contact with you from Jordan Peterson videos and God is leading me. I am inumdated with so much information especially Canadian. What’s going on? Please keep up your clear writing of needed subjects. We need some encouragement about youth and the world today. The older one gets the more bleak things look. My hope is in youth. A very touching article that hit home. I lost my mother to dementia last November. The loss still hurts, but the loneliness for her will last much longer. Please remember to never stop praying for your father. 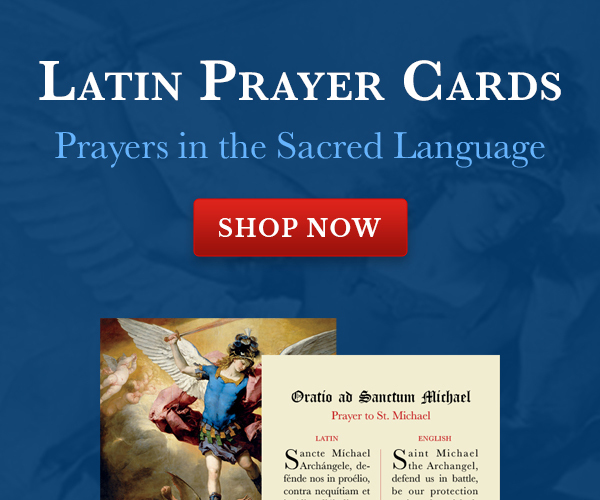 He needs your prayers more than ever now so he can be released from Purgatory. When your prayers get him to heaven, he then can pray for you at your moment of truth. We had the pleasure of joining you, Jeff Cavins and the Catholic Answers crew on a cruise about fifteen years ago when you brought your father with you. We often remembered how loving you were to him and we are so sorry for your loss. Please accept our sympathies and we hope you and your family are ,with God’s help, able to work through this difficult time. Hey C and K: That was a great cruise. A grace for me and my dad, too. Thank you. May our Lord heal your heart. I lost my momnalmost 26 years ago when I was 25. It was relatively sudden. It was, and has been, a difficult thing. A year and a half ago, I lost my dad. He was 92. My relationship with each parent was so different. One left as I was getting my adult life started and the other witnessed all those life-changing moments of weddings, births, etc. The graces about still, and each helped my grow in ways that only pain can stretch you. Prayers for you and your family. Great indeed Patrick! What a commendable homage to your Dad! Heartfelt condolences. May the good Lord rest your Dad in eternal peace. You have really touched my life. I too have lost my beloved parents few years ago and few month’s back my only Brother-in-law too. I am experienced the unbearable pain and sorrow one faces on account of the departure of our near and dear ones. However,being Christians, we can repose our faith in the the biblical teaching with confidence that we will meet them in heaven again and therefore, we know that death is not the end but it is inevitable for a good cause. Let us console and turn to the Lord Jesus with our prayers. Thank you for sharing such a beautiful experience. Wish you and family a God blessed life ahead. Prayful Greetngs from Aikkarakanayil Augustine Jose, Vadodara, Gujarat State, INDIA.